HDR or 'high dynamic range' photography is a simple concept. You use your iPhone's camera and enter HDR mode and start shooting. What happens is that every time you take a photo, three images are shot. Low, regular and high - these images are then combined to create one really cool image that seeks to capture the image in as close to reality as possible both in terms of lighting and the mood at that time. 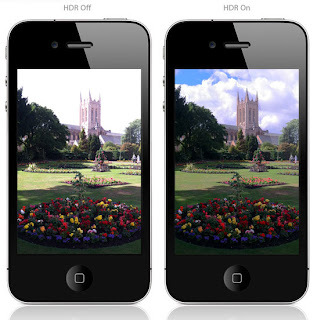 The iPhone 4 and iPhone 4S has HDR mode which you can make optimal use of to capture some amazing shots and impress all your friends with your photography skill. This is a brief guide to help you make the most of your iPhone's HDR photo capture mode. of course the most high-quality HDR photos are taken with dSLR cameras and then edited in programs like Photoshop. Currently available on the iPhone 4 and iPhone 4s. Head over to your camera > tap options > HDR on. Once your photo has been captured you will see two shots on your iPhone, one which is normal and the other will be the HDR photo. Swipe back and forth to see the difference. HDR is most suited for landscapes, nature, scenery, wildlife and cityscapes. HDR can also be used when taking photos inside your home - especially when the light is not so good. Using HDR will give you a shot that combines three photos, underexposed, normal and overexposed. This should come closest to the actual light condition that you're hoping to capture.